This is a NO PREP project! Students gain and apply skills by working on a long project. They complete an in-depth inquiry into a specific topic. Students love the choice option! Students can write a 7 paragraph research report or the graphic organizer can be used in place of the report for differentiated instruction. *6-8th Grade Common Core Aligned. *You can choose with and without Common Core State Standards on your requirements page. *There are reference choices for the MLA, APA, and CMS formats. *There are representation/dress up/artifact, tri-fold, and float versions as options for this project. *Students will write a 7 paragraph research report. *Gives students a choice for their artifact. *Zip folder contains 3 PDFs and 1 PowerPoint. 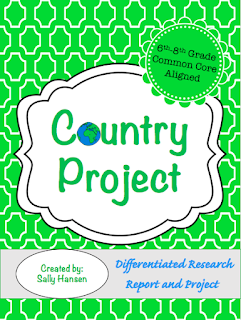 Additionally, for the modified Country Project, choose what you need to use from the selection. All the resources in the PDF are not duplicates. They are additional resources or have been modified to meet student needs.